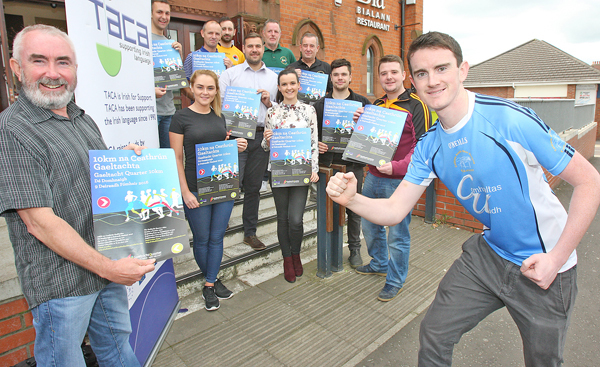 A group of Irish-language speakers have come together in Belfast to organise the inaugural Gaeltacht Quarter 10KM race in the west of the city. The race will kick off at 9am on Sunday, October 9 with all proceeds from the registration fee going directly to the chosen charity TACA, which provides support for the development of Irish medium education. Every runner will then have the chance to raise money to aid the growth of the language. Speaking at the launch of the Gaeltacht Quarter 10KM in Cultúrlann McAdam Ó Fiaich, Pat Ó Cianáin from TACA said: “We are very proud to be helping to organise the inaugural Gaeltacht Quarter 10KM, and even more so that TACA is the chosen beneficiary. He added: The Gaeltacht Quarter route will be from the Falls to the Upper Springfield, the Glen Road, Shaws Road and back. This route is officially recognised as a designated urban Irish language area and this race seeks to celebrate the Irish language schools and community which have inspired and motivated an entire movement for nearly 50 years. This event is open to anyone over the age of 15 with entrants being asked to register online as soon as possible to ensure they receive their desired t-shirt choice. Registration will also take place on the day from 8am at Cultúrlann McAdam Ó Fiaich.